Schema markup has become a major, yet underused, SEO tactic for recruiting. Optimizing your job pages for SEO can cause a leap in applications from Google, Bing and others. What is Schema? 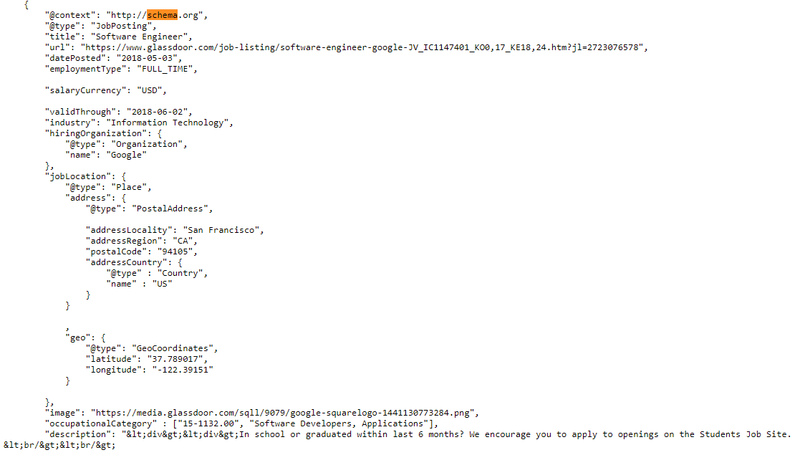 It’s a way for search engines to more easily read, analyze and classify your job postings. But, to unlock these benefits you have to provide a list of schema properties in your HTML code. Below are two tables: one for required properties and one for recommended properties. We recommend providing both types of properties to maximize your job’s SEO potential. title "title" : "Software Engineer"
employmentType "employmentType" : "FULL_TIME" "FULL_TIME"
} Where your job is located in terms of latitude and longitude. Go to your job posting. Press Ctrl + U (on PC) or Command + U (on Mac), this allows you to view the source code of the page. Press Ctrl + F (on PC) or Command + F (on Mac), this allows you to find and search words you type in. Type in any of the required or recommend properties in the tables above to see if your pages have schema markup. If you’d like Ongig’s help instead, just reach out for a demo. Ongig’s software automatically builds Schema.org and other SEO tactics into all of your job pages.